A Muslim teaching assistant suspended for refusing to remove her veil in class should be sacked, a local government minister has said. Phil Woolas told the Sunday Mirror that Aishah Azmi, 23, had "put herself in a position where she can't do her job". Mr Woolas, whose brief covers race relations, stopped short of repeating the demand on the BBC's Politics Show. But he said if the head teacher at the school in Dewsbury, West Yorkshire, chose to sack Ms Azmi "so be it". Ms Azmi, who is originally from Cardiff, said pupils at Headfield Church of England Junior School had never complained about her wearing a veil. She said she would remove the garment, but not in front of male colleagues. Ms Azmi's lawyer called for Mr Woolas to withdraw his comments, which he warned might influence the classroom assistant's employment tribunal. "Mrs Azmi is very well able to carry out her role as a teaching assistant providing support to pupils who speak English as a second language," said Nick Whittingham, of Kirklees Law Centre. "She is able to do this effectively while wearing the veil. She has demonstrated in a number of interviews that she can communicate effectively while wearing the veil." Mr Whittingham described Mr Woolas's comments to the Sunday Mirror as "ill-advised" and called for him to withdraw his demands. Kirklees Council earlier said that Ms Azmi had been asked to take off her veil in class because children had difficulty understanding her in English lessons. When she refused to remove the veil, she was suspended pending an employment tribunal. The council said the school's action had "nothing to do with religion". 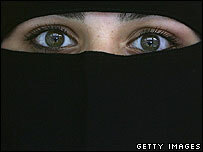 Ms Azmi told the BBC her veil had not caused problems with the children, with whom she had a "brilliant relationship". "The children are aware of my body language, my eye expressions, the way I'm saying things. "If people think it is a problem, what about blind children? They can't see anything but they have a brilliant education, so I don't think my wearing the veil affects the children at all." But Ms Azmi later admitted she had taken the veil off to be interviewed for the job by a male governor. The Leader of the Commons, Jack Straw, initiated a debate on veil-wearing last week when he suggested the full veil over the face separated communities. His comments were supported by shadow home secretary David Davis who, writing in the Sunday Telegraph, said Mr Straw had "touched on...the fundamental issue of whether, in Britain, we are developing a divided society". Mr Davis went on to question whether a form of "voluntary apartheid" was being inadvertently encouraged. London Mayor Ken Livingstone also weighed into the debate, saying he would like Muslims to give up the veil, but adding that change could not be imposed from outside. A survey in the Guardian newspaper suggested 53% of people supported Mr Straw in thinking the veils create a barrier between Muslims and other people.